The bottom of this tool chest is a frame like the lid, with a single panel. 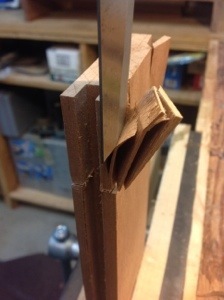 Looking closely at the grain I took a chance and decided to split the waste from the tenons using a chisel. This is definitely my preferred method to remove the waste and if all goes well, much quicker. Grain direction is the critical element when using a chisel to remove the waste. After laying out the tenon and sawing along the bottom I look at the grain and try to determine where it will split. If the grain looks like it will split into the tenon I stop, grab my saw and cut the tenons. If the grain looks like it will split parallel to or away from the tenon I place the tenon in my vise and make some test cuts. I place my chisel approximately half way into the waste and and on one side and give it a tap. Watching the split I can confirm that the wood will split where I intend. I then move to the other end and a place my chisel half way and make another test tap. If this works I go ahead and remove the waste. 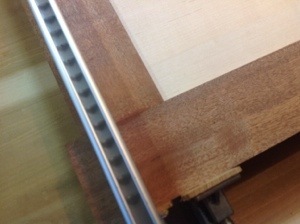 Using this method of checking each end of the tenon has been particularly helpful with the Sapele. The grain can change dramatically over a few inches and where I can use a chisel on one end of the tenon I may not on the other. 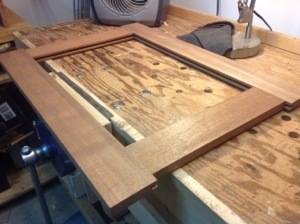 I saw two of the tenons and split the other two and quickly finish the mortise and Tenon joints. Most of the joints fit well, but I still have a little bit of work to smooth the joints. Rigging up a clamp n my vice I am able to support the bottom while I use a plane and cabinet scraper to smooth all of the parts. 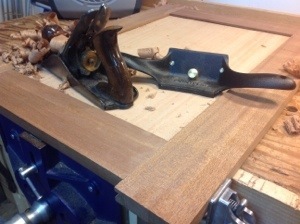 Sapele has been fun to work, but I could never have gotten by without my cabinet scraper. Richard, I agree about the Sapelle and the cabinet scraper. I also prefer the splitting method with the tenons. 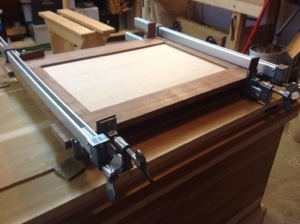 I just picked up the Veritas Skew block plans for trimming the tenons after I have split them. Great tool!! Your tool chest looks like it may be on par with Pau’s. Great job. My first one will be out of pine I think (for practice).